When your opponent unleashes a punch, sometimes it’s difficult to get away so you have to resort to blocking it. When you block a punch, you can get a feel of how hard your opponent punches and whether he drops his guard when throwing. However, it’s not always as easy as it seems to block, especially when there’s a barrage of punches. Learn how to block a punch properly to ensure that you minimize the risks associated with blocking punches. If you want to learn step-by-step the boxing fundamentals, I would recommend you to check out the How to Box in 10 Days course, which has helped thousands of fighters and non-fighters online. Keep Your Guard High (1): Half the palm of your glove should be covering the side of your face while the other half should be sticking out so you don’t get caught with your nose or chin sticking out. Keep Your Eyes Focused (2): Even though your guard is up high, you’ll be able to identify when your opponent is going to make a move if you focus on his center chest / chin area. You will see his shoulders moving especially when he throws hooks. Tuck In Your Chin and Elbows (3) : Keep your chin down low towards your chest and your elbows tucked in covering your kidney sections. Roll With the Punch: Though you’re blocking the punch, you should always roll with it to minimize the impact of it and to get yourself in position for a counter or to block the next punch. This is crucial when facing big punchers because just the force of their punches will cause your body to shift if you don’t roll with them. To block the lead hook to your head, use your rear arm to catch the punch and roll with it at the same time. You do this by rotating your hips anti-clockwise (if you’re both orthodox) or clockwise (if you’re both southpaws). Doing this successfully will leave you in a great position to counter with your own lead hook. The clip on the right shows James Toney blocking the lead hook to the body and head, then quickly counters with a short rear hook, though he could just have easily thrown the lead hook also. To block an overhand or the rear hook, you catch the punch with your lead arm and rotate your hips clockwise (if you’re both orthodox) or anti-clockwise (if you’re both southpaws). You can then counter with a lead hook, a short cross, rear hook or overhand. This is the exact same method as blocking hooks upstairs, but you must lean slightly to the side that the punch is coming from to catch the punches with your elbows. You don’t lower your arms because your opponent may follow up with a hook upstairs. 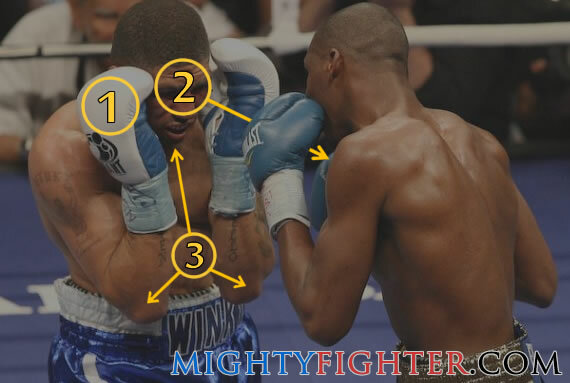 To block either the rear or lead uppercut, follow the exact same method for blocking hooks. 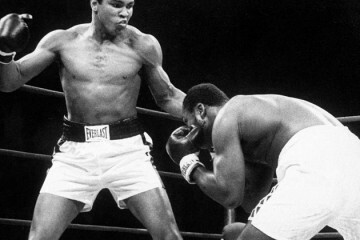 You’ll find that as you rotate your hips, the uppercut will be deflected and will just graze past your arm. Be careful not to bend at the waist and lean forward otherwise you may just end up meeting an uppercut head-on. The cross comes from the opponent’s rear hand, so you must block it as though it were a rear hook or overhand, and you must rotate your body a bit further since the cross comes in a straight line and not from the side. You’ll find that as you do this, the punch will deflect itself from your glove and you can counter with a cross of your own or a rear hook, uppercut or overhand (depending on how your opponent is positioned). On the clip to the right, you see Miguel Acosta blocking and rolling the lead left hook, then he rolls and blocks the right cross, which leaves him in position to counter with a combination. Your opponent will throw the cross usually to the solar plexus (center area just above the belly button) from mid-range. 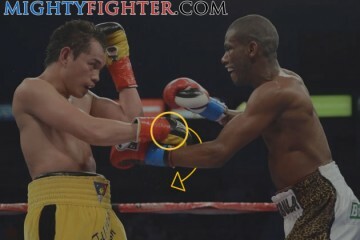 This means that you can use your both your elbows to catch the punch by closing them inwards slightly. At the same time, you should be bending at the knees and waist slightly (so your back is hunched over like a turtle’s shell) to reduce the impact. Being Stationary for Too Long: Don’t stand still in one spot too long while blocking. Your opponent will just circle you and throw punches from various angles so you can’t see them coming. Pivot away, bob and weave and make your opponent miss then make him pay. Closing Guard: If you close your guard down the middle to block straight punches, you will leave yourself open for hooks around the side. You’ll also close off your direct line of vision. 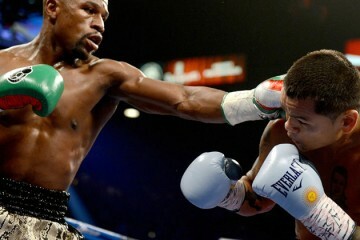 Getting Trapped on the Ropes or in the Corner: If you ever get trapped on the ropes or in the corner, you may be able to block a few punches, but you must then pivot out the way with your guard up as soon as possible. Even when you’re in the center of the ring, it’s always a good idea to block then pivot if your opponent is throwing a barrage of punches. Squaring Up: Always keep your foot positioning the same as the proper stance. If you square up, you can easily be pushed off-balance and you cannot get any proper leverage into your punches. Walking in Without the Jab: Some fighters will often adopt a high guard and walk forward in straight lines without throw the jab. If you do this, you may be able to block a lot of punches, but you won’t be able to mount any proper offense especially against a mover. You need to walk in with a solid jab to set up the rest of your offense. Standing Straight Up: If you stand upright with your legs straight, you’re just leaving your body more exposed and you won’t have a solid foundation. Keep your knees bent slightly so you can quickly catch body and head punches with your arms and elbows. Pulling Back in a Straight Line: Even though you have your guard up high, you still shouldn’t pull back in a straight line. If you do, you’ll just make it easier for your opponent to throw punches down the middle which will be hard to block while pulling backwards. 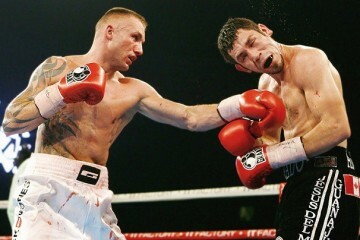 Closing Eyes: It’s painfully obvious why you shouldn’t close your eyes when punches are coming towards you. Beginners are usually guilty of this, even experienced fighters do this, but it’s a bad habit that you must break out of. Wrong Guard Positioning: When trying to block punches, some fighters have their guard too far out in front or too far back covering their ears. Either way is not good because you can either get caught around the sides or on your nose and chin area. Half the palm of your glove should be covering your face and the other half sticking out. Blocking punches is necessary for inside fighting and very useful at mid-range, but by no means should you resort to blocking as your only form of defense. If someone has fast hands and fights on the outside, then it’ll be difficult to block and counter because as soon as you block a punch, they may already be gone. Get a partner to throw synchronized punches to your body and head while you practice blocking them. Your partner can use mitts as well as boxing gloves, if you want to block and counter, as well as mixing it up. It’ll be tough constantly blocking against a powerful puncher because your arms will eventually get tired. Instead, you must block, bob and weave, parry and slip punches in order to become a defensive wizard.